Nut Hammer... An original nut-cracker with a silicone head. Just place a nut in the silicone stand, hit with the hammer against a hard surface and crack the nut! Dark wooden grip, upper part in cast steel and a silicone shock absorber. Always check you are using this nut cracker in flat surfaces that can hold the blow. 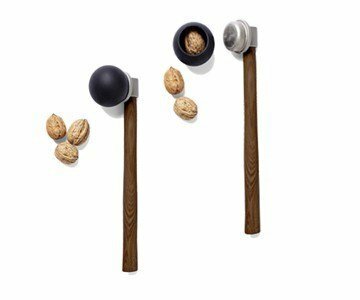 Very easy for both younger and older hands, and much more fun than an ordinary nut-cracker!